If you’ve noticed one thing about Bruno Mars recently, it’s the crooner’s infectious new song that proves his mastery of nostalgia (looking at you, satin disco undertones). If you’ve noticed two things, it’s that Mars has been rocking a lot of formal shorts* during his 24k Magic press tour. 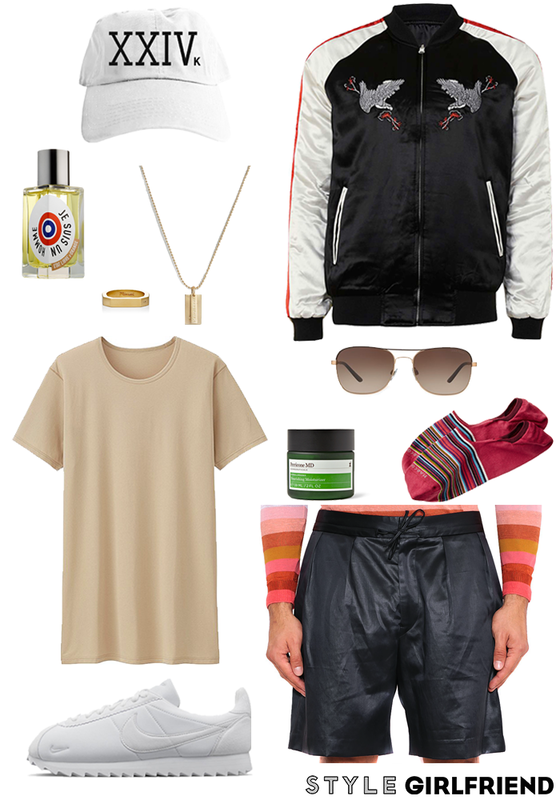 While it took some ladies (okay, it was just me) at Style Girlfriend headquarters longer than others to fully endorse this look, we all agree that it’s golden when done right. Since temperatures are flirting with 80 degrees well into autumn, we’re breaking down how to wear the better half of pants in an unexpected style. *Formal shorts: Official term coined by Megan for shorts that are a few degrees fancier than your workout shorts, thus able to be dressed up. Mars’ keeps his look pulled together with the help of luxe fabrics and intentional color schemes. An admittedly bold move for anyone, he makes it work by pairing similar fabrics together (AKA he’s not wearing nylon track shorts with a satin button down) and utilizing basics to keep the look simple. Focus on fabric. Stray from sporty fabrics like nylon or cotton in favor of wool, twill, or yes, even sateen. Mind your shoes. Let’s consider the two layered looks above. Adding an oxford or a brogue to a preppier look will immediately feel polished, while opting for a minimal slip-on or cool (non-athletic) sneaker will tie a trendier look together. HOW DO YOU DRESS UP THE MORE CASUAL PIECES IN YOUR WARDROBE?